Express jeans on major sale! My best friend has always told me that as long as she has her lips painted and her lashes on, she feels like she can go out and conquer the world. In theory I agree although not entirely in practice. I've been known to go without makeup pretty often. This is mostly due to laziness of course, but sometimes a girl just needs a break from all the "war paint". Anyway, during my trip to scour the Nordstrom anniversary sale a couple weeks back, I spotted the line of one of my all-time favorite style bloggers. Julie from Sincerely Jules has her own clothing brand comprised of mostly tee shirts and cool girl pieces. I'm not normally a fan of graphic tees, but as soon as I spotted a doll face staring back at me, I knew I couldn't pass it up. It's darling! And how original of me to pair it with bright pink lips? Totally necessary. Full disclosure: I don't usually have high hopes for celebrity clothing lines, but I have to admit I'm impressed. The quality is definitely there. The cotton is super soft, and the relaxed fit looks great with skinny denim and classic pumps. I'd sleep in it if I could but since I want this one to last, I'll stick to keeping it away from my lounge wear/workout tops/PJ drawer that most of my t-shirts sadly end up in. I have this tee too and I love it!! Oh good, I would love to see more styling ideas! I know Julie has tucked it into a skirt. She always looks amazing. 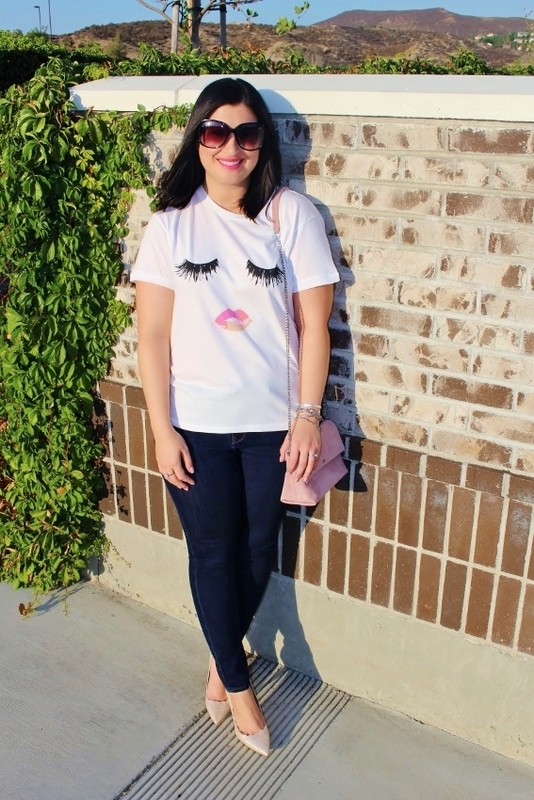 This graphic tee is so cute - it's like it was made for beauty bloggers lol! Love the lipstick you're wearing in this pic! Thank you Zeba! I could see you wearing it too. 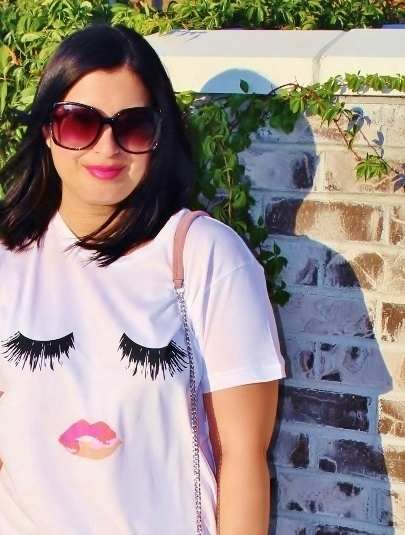 And I agree that it was made for girls like us who are a little obsessed with beauty products :) Her other tees are cute as well but this one just stuck out! I totally purchased this tee, I've resisted it for a while but it's just too cute.